Ellie Goulding may be virtually unknown here in the States at this moment, but with the March 8th release of her debut album, Lights, that's all going to change. Goulding, who last year, splashed onto the scene in the UK is ready to take America by storm in 2011. The 24 year old "folktronica" singer/songwriter from Hereford, England has already released 5 singles and is planning on releasing single #6, the album's title track "Lights" (and easily one of my favorites). Last year Goulding's star really started to shine bright as she embarked on a journey with her first album. After a semi shaky chart-start with first single, "Under The Sheets" only peaking at #53 on the UK charts, Goulding moved steadfastly forward and released single #2, "Starry Eyed" which would go on to become her very first Top 5 hit. While follow up singles failed to reach the same heights on the charts, Goulding's album went straight to the top upon debuting back in March of 2010. After releasing her fourth single, "The Writer," the big question on every Ellie Goulding fan's mind was "What's going to be the next single?" 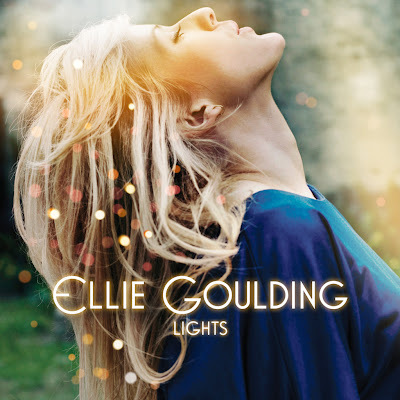 After the announcement came that Goulding's UK label Polydor was repackaging her debut there was talk of "Lights" being the fifth single, however her cover of the Elton John classic "Your Song" took it's place and went all the way to the #2 position on the Official UK Singles Chart when it was released in November, becoming Goulding's highest charting single to date. Now that we're coming upon the one year anniversary of her album's debut, we have not only a sixth single ("Lights" - FINALLY!) but plans to release her album in America AND to support it with a tour. Amazing! To help celebrate the pending release of her album on this side of the pond, Goulding has put out a little EPK video which provides fans with insight into the album making process, meaning behind some of the songs mixed with a little of her back story, influences, etc. I can't freakin' believe that Lights is FINALLY coming out here in America. What's more, Goulding announced via Twitter today that we can expect an announcement on her U.S. tour sometime next week. 2011 is really shaping up to be a good year in music and Cherrytree Records has a lot to do with that in my book. While we're waiting for the album to drop stateside, take a look at the newly released artwork for her U.S. debut (ABOVE), check out the album's official tracklisting (HERE) and go check out Ellie Goulding's debut EP on iTunes now (HERE) and go check see her at Coachella this year on Sunday April 17th! Oh and UK fans can watch the new video for "Lights" over on VEVO HERE. Sorry America...no love for us on that front :-( You CAN watch Ellie's lovely video EPK down below. Get ready for Ellie's tour announcement next week. So freakin' excited! As a side note, you can catch Goulding in the new Tinie Tempah video for new single "Wonderman" which should be released sometime tomorrow, January 22nd.